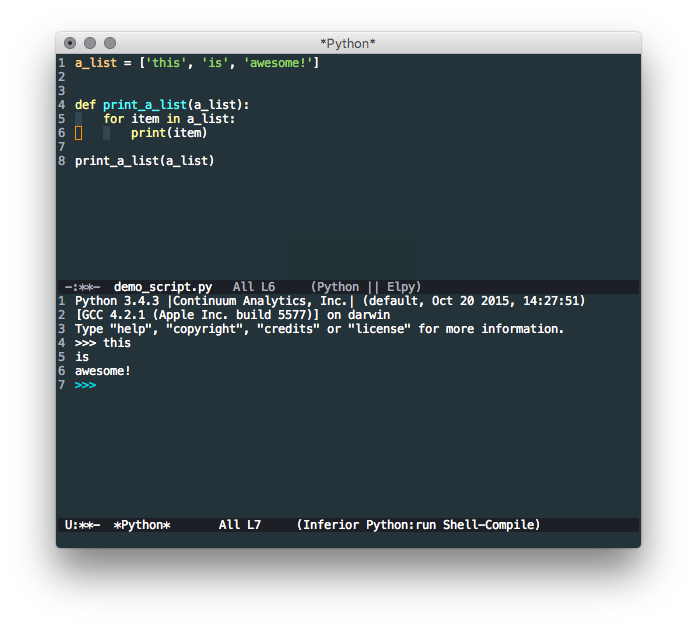 In this post we’ll present another powerful editor for Python development - Emacs. While it’s an indisputable fact that Emacs is the best editor, we’ll (try to) keep an open mind and present Emacs objectively, from a fresh installation to a complete Python IDE so that you can make an informed decision when choosing your go-to Python IDE. 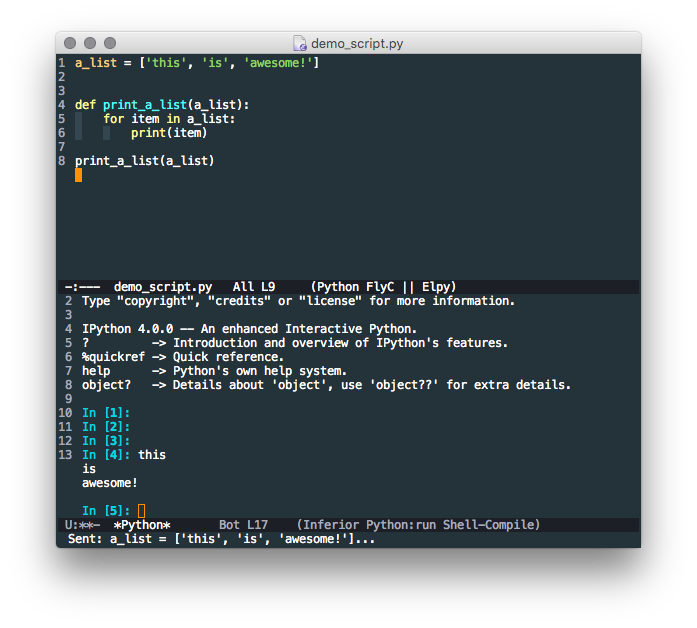 Free Bonus: Click here to download a copy of the "Emacs + Python Setup Guide" with tips and tweaks to optimize your Python development setup. Another topic that does not need to be covered again is the basics of using Emacs. The easiest way to learn Emacs is to follow the built-in tutorial. The topics covered in this post do not require that you know how to use Emacs yet; instead, each topic highlights what you can do after learning the basics. Thus, C-f would be: hold the CONTROL key and type f.
M-<chr>  means hold the META or EDIT or ALT key down while typing <chr>. ESC key and then type <chr>. We write <ESC> for the ESC key. So, key entries/commands like C-x C-s (which is used to save) will be shown throughout the remainder of the post. This command indicates that the Ctrl and X key are pressed at the same time, and then the Ctrl and S key. This is the basic form of interacting with Emacs. Please follow the built-in tutorial as well as the Guided Tour of Emacs to learn more. One of the great benefits of Emacs is the simplicity and power of configuration. The core of Emacs configuration is the Initialization File, init.el. Meanwhile, in Windows, if the HOME environment variable is not set, this file should reside in C:/.emacs.d/init.el. See GNU Emacs FAQ for MS Windows > Where do I put my init file? for more info. Configuration snippets will be presented throughout the post. So, create the init file now if you want to follow along. Otherwise you can find the complete file in the Conclusion. 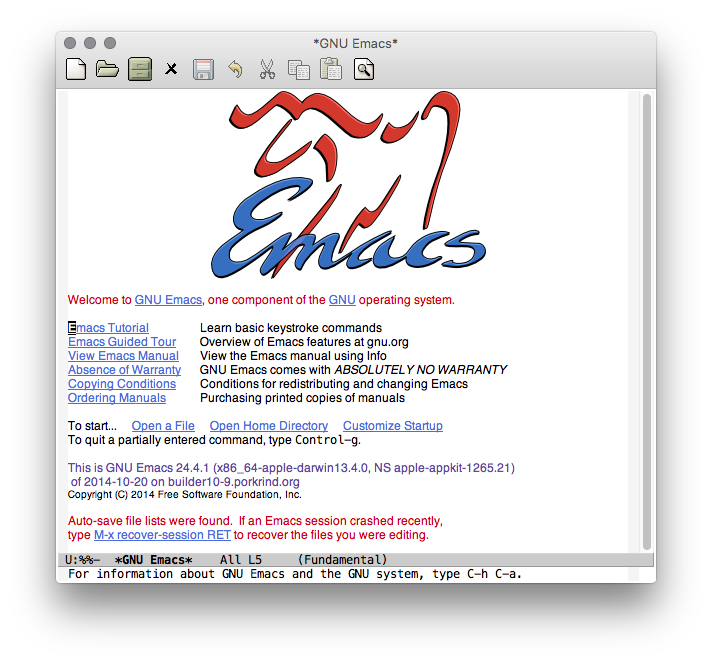 Packages are used to customize Emacs, which are sourced from a number of repositories. The primary Emacs package repository is MELPA. All of the packages presented in this post will be installed from this repository. The first section of the configuration snippet, ;; INSTALL PACKAGES, installs two packages called better-defaults and material-theme. The better-defaults package is a collection of minor changes to the Emacs defaults that makes a great base to begin customizing from. The material-theme package provides a customized set of styles. My preferred theme is material-theme, so we’ll be using that for the rest of the post. Disables the startup message (this is the screen with all the tutorial information). You may want to leave this out until you are more comfortable with Emacs. Enabling something globally means that it will apply to all buffers (open items) in Emacs. 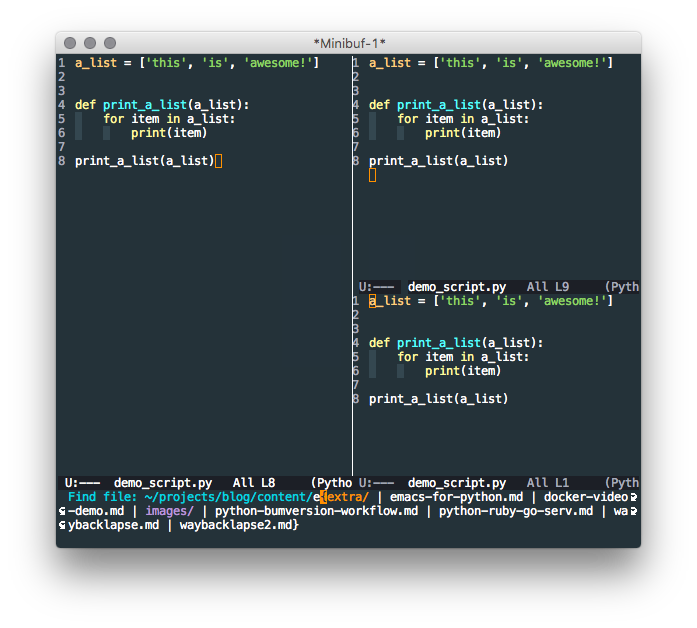 So if you open a Python, markdown, and/or text file, they will all have line numbers shown. 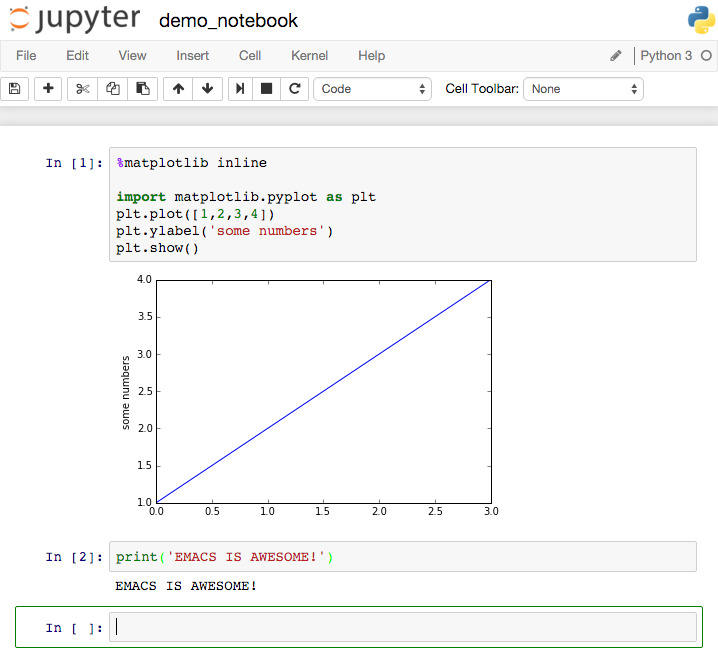 You can also enable things per mode - e.g., python-mode, markdown-mode, text-mode. This will be shown later when setting up Python. 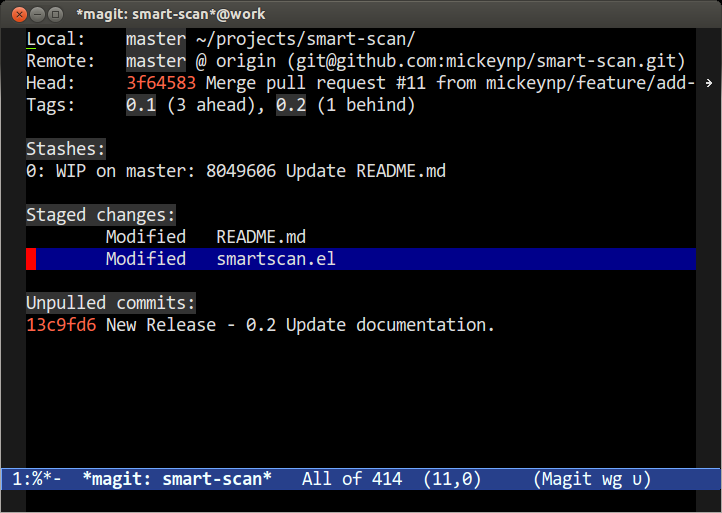 Now that we have a complete basic configuration file we can restart Emacs and see the changes. If you placed the init.el file in the correct default location it will automatically be picked up. With this basic configuration complete we can begin to dive into configuring the environment for Python development! 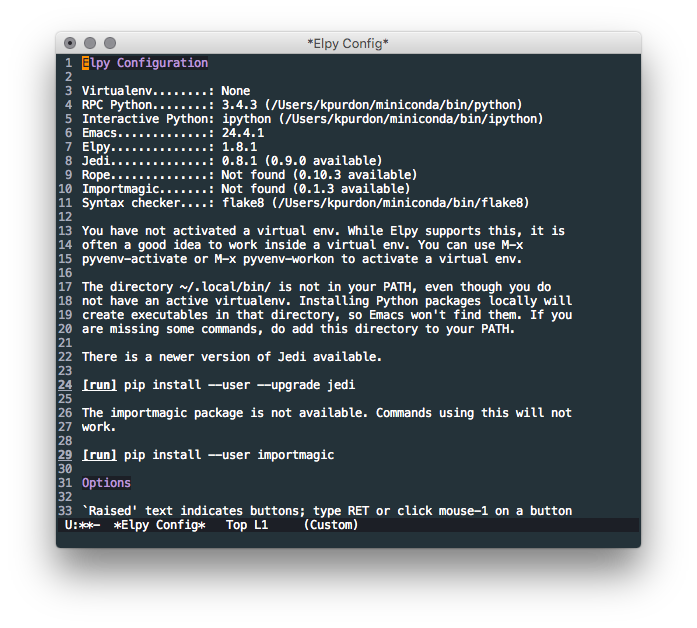 To install and enable elpy we need to add a bit of configuration and install flake8 and jedi using your preferred method for installing Python packages (pip or conda, for example). With that, all of the basics of a Python IDE in Emacs have been covered. Now let’s put some icing on this cake! 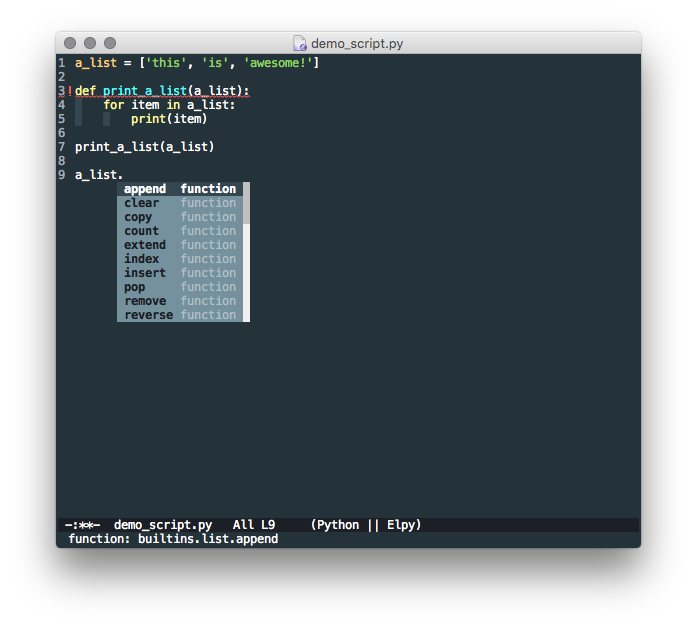 In addition to all the basic IDE features described above, Emacs provides some additional features for Python. While this is not an exhaustive list, PEP8 compliance (with autopep8) and integration with IPython/Jupyter will be covered. However, before that let’s cover a quick syntax checking preference. Love it or hate it, PEP8 is here to stay. If you want to follow all or some of the standards, you’ll probably want an automated way to do so. The autopep8 tool is the solution. It integrates with Emacs so that when you save - C-x C-s - autopep8 will automatically format and correct any PEP8 errors (excluding any you wish to). However, we can complete the exact same task by connecting to and interacting with the notebook server directly in Emacs. In addition to lots of other Emacs configuration goodies. After learning Emacs you’ll want Emacs keybindings everywhere. 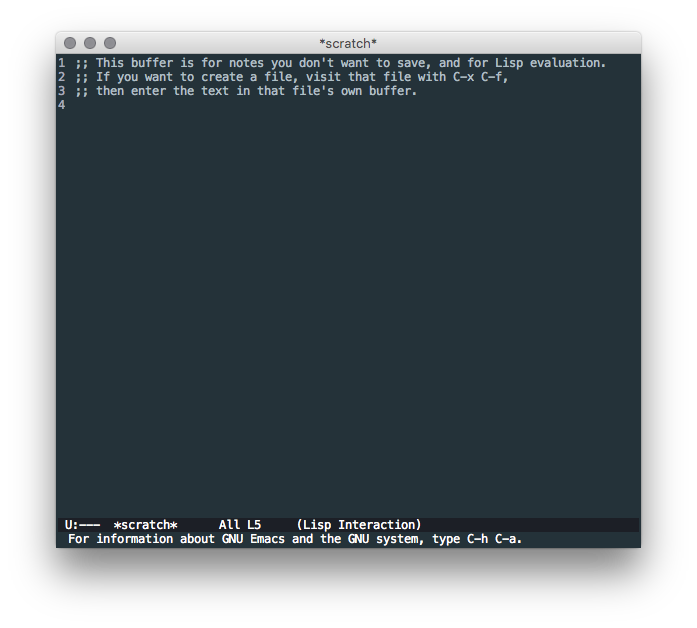 This is as simple as typing set -o emacs at your bash prompt. However, one of the powers of Emacs is that you can run Emacs itself in headless mode in your terminal. This is my default environment. To do so, just start Emacs by typing emacs -nw at your bash prompt and you’ll be running a headless Emacs. As you can see, Emacs is clearly the best editor… To be fair, there are a lot of great options out there for Python IDEs, but I would absolutely recommend learning either Vim or Emacs as they are by far the most versatile development environments possible. 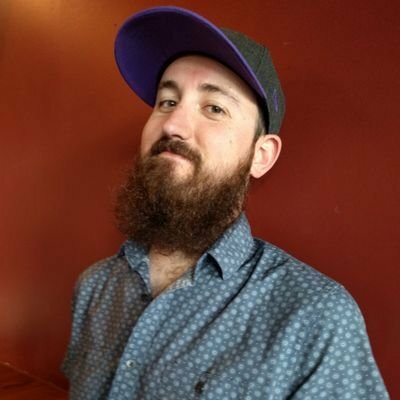 Hopefully this configuration will spark your Emacs journey! Kyle is a software engineer in Boulder, CO. He is a Python first developer with experience in Ruby, Golang, and many more languages.